NOTE: All Text is in German - Each card contains a list of numerical stats (Height, Weight, Strength, Power, and Weapons). The object of the game is to compare these values to try to trump and win an opponent's card. Featuring the Avengers, Fantastic Four, Hulk, Spider-Man, Wolverine, and more vs. Doctor Doom, the Green Goblin, Doctor Octopus, Galactus, and more! Featuring artwork by John Byrne, Mike Zeck, Walt Simonson,Paul Smith, Ron Frenz, and other industry legends. 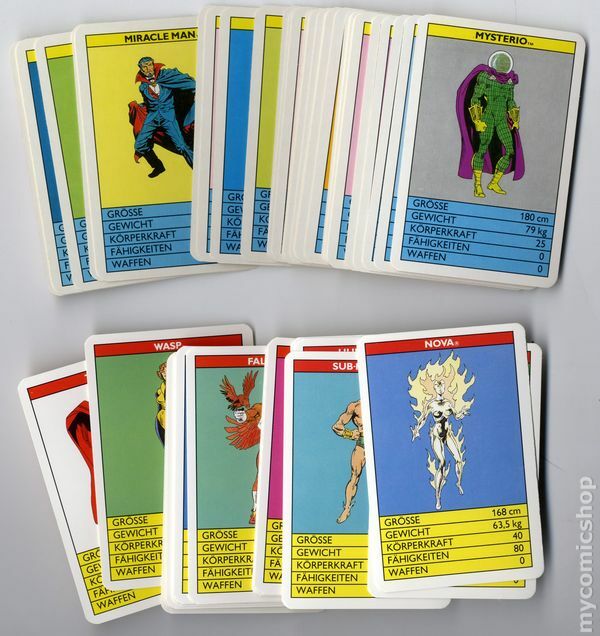 Includes 2 decks with Plastic cases: A Hero Deck (32 cards plus cover card) and A Villain Deck (32 cards plus cover card). NOTE: All Text is in German. The plastic cases have minor cracks and wear. The Near Mint Price refers to the cards.